The place to visit to personalize your blog is your profile page on your WordPress Dashboard.To access your profile page, click the Your Profile link in the Users menu. You’re taken to the Profile page. Visual Editor: This selection enables you to use the Visual Editor when writing your posts. The Visual Editor gives you the formatting options you find in the Write Post page. By default, the Visual Editor is on. To turn it off, select the Disable the Visual Editor When Writing check box. 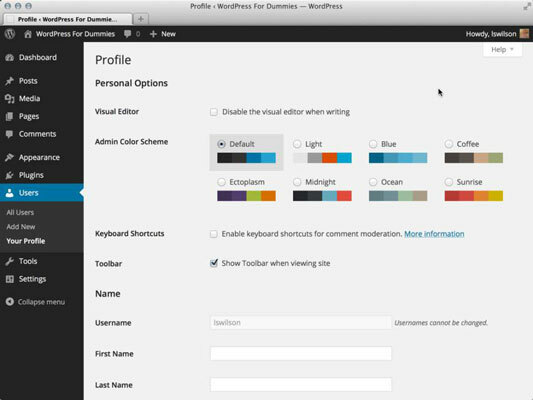 Admin Color Scheme: These options set the colors on your Dashboard. The default is a black and gray color scheme with blue as a highlight color; you can also select more colorful schemes for your Dashboard display, like Light, Blue, Coffee, Ectoplasm, Midnight, Ocean, and Sunrise. Keyboard Shortcuts: This enables you to use keyboard shortcuts for comment moderation. To learn more about keyboard shortcuts, click the More Information link; you’re taken to the Keyboard Shortcuts page in the WordPress Codex. Toolbar: The Toolbar displays at the top of your WordPress website, but it displays only to the user who is logged in to the site. The Toolbar contains helpful links that allow you to get to different sections of your Dashboard quickly and easily with a single click. You can choose to display the Toolbar while you are viewing your site or the Dashboard, or both. Name: This section is where you can input personal information such as your first name, last name, and nickname, and specify how you want your name to be displayed publicly. Fill in the text boxes with the requested information and choose your display name from the drop-down list. Contact Info: In this section, you provide your e-mail address and website URL to tell your visitors who you are and where they may find you on the web. Note that your e-mail address is the only required entry here. This is the address WordPress uses to notify you when you have new comments or new user registrations on your blog. Make sure to use a real e-mail address so that you get these notifications. About Yourself: This section is where you can provide a little bio about yourself and change the password for your blog. When your profile is published to your website, it not only can be viewed by anyone, but also gets picked up by search engines such as Yahoo! and Google. Always be careful with the information in your profile. Think hard about the information you want to share with the rest of the world! Biographical Info: Type a short bio in the Biographical Info text box. This information can be shown publicly if you are using a theme that displays your bio, so be creative! New Password: When you want to change the password for your blog, type your new password in the first text box in the New Password section. To confirm your new password, type it again in the second text box. Directly below the two text boxes is a little password helper. WordPress helps you create a secure password. It alerts you if the password you’ve chosen is too short or not secure enough by calling it Very Weak, Weak, or Medium. When creating a new password, use a combination of letters, numbers, and symbols to make it hard for anyone to guess. When you create a password that WordPress thinks is a good one, it lets you know by calling it Strong. Change your password frequently. This is strongly recommended. Some people on the Internet make it their business to attempt to hijack blogs for their own malicious purposes. If you change your password monthly, you lower your risk by keeping hackers guessing. When you finish setting all the options on the Profile page, don’t forget to click the Update Profile button to save your changes.